We woke up early, and made our way to the festival. Our first stop was the Lowenbrau tent. We ate a nice breakfast of meat and a liter of beer. This place was a little crazy for us so we moved on to a tent that was a little calmer, ordered half a liter, and took in the sights. The tents were all huge, the outfits amazing, and just pure debauchery everywhere we looked. At this point we were feeling pretty good and we made our way to the Paulaner tent, which was insane. We made friends with some young German kids (ages like 15-17), drank waaayyy too much, ate a gross pretzel, and went home by like 6 pm. We both immediately went to bed (and I may or may not have woken up around 10 pm to throw up...). We had SO much fun, but definitely paid for it later (or at least I did, Dennis slept through most of me being sick). It was a rough night. The next morning, we woke up and went to Oktoberfest again- but this time our focus was food. We ate lots of meats (and accidentally ordered a 10 euro bottle of gross carbonated water from a very rude waiter) and did not drink any beer. We explored for a bit then made our way back towards our apartment. We ate dinner at a place nearby called Zum Alten Kreuz that was so incredibly good. We got pumpkin soup and I ordered some kind of pork (that also came with bacon) and Dennis got venison goulash. After our yummy dinner we made our way to this club Muffathalle for Action Bronson! Some of you know we bought these tickets months ago, way before much of our trip was planned, so we were very excited. And for those of you who don't know Action Bronson, he is a ridiculous rapper/foodie from Queens. We love him and were psyched to see him perform in Germany. The club was really cool, Action was great, and he even heard Dennis yell out something about Brooklyn and replied with "Brooooklyn in the house!" It was awesome. Our last day in Munich was spent relaxing, exploring, and playing shooting games at Oktoberfest (we did great and won a stuffed moon). Füssen is a small town in southern Germany located on the Lech River and about 5 km from the Austrian border. Our main reason for visiting Füssen was to see Neuschwanstein Castle, a famous Bavarian palace commissioned by Ludwig II of Bavaria in the late 1800s. Neuschwanstein was the inspiration for Sleeping Beauty's Castle in Disneyland and was one of the inspirations for Cinderella's Castle in the Magic Kingdom. It is also a place that I have wanted to visit pretty much ever since I knew it existed. Sleeping Beauty was my favorite Disney movie growing up and my mom had an old poster of Neuschwanstein that I acquired a few years ago (which was most recently hanging in our apartment in Brooklyn), so this trip was awhile in the making. It's possible to go to the castle as a day trip from Munich but I'm glad we opted to spend a few days in Füssen. We stayed at a super cute (albeit a little expensive..) hotel called Hotel Hirsch, spent a (very cold) day at the castle, ate several delicious meals, and explored a very fairytale-esque town. Heidelberg is city in Germany just south of Frankfurt that has special meaning for me. I studied at the University of Heidelberg during the summer of 2006 with my friend Tara- right before Dennis and I met (and my grandfather was stationed at the army base in Heidelberg so my dad lived there for awhile when he was younger!). One of Dennis' first memories of me in class was when I pitched an idea for a video on the study abroad program at SCSU because I had just returned from a summer in Germany so it was cool to be able to take him there (9 years later!). We spent the day walking around the old city. I showed Dennis the university and the apartment building where Tara and I lived (I couldn't believe I remembered where it was!). We got dinner at Schnitzelhaus, an amazing restaurant that Tara and I loved where you can choose from over 100 different kinds of schnitzel. We were not disappointed. 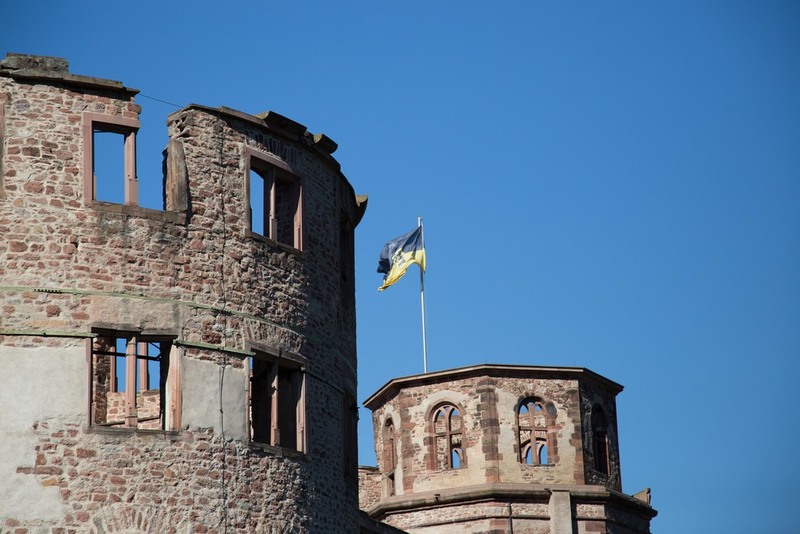 The next day we went to Heidelberg Castle which is a pretty famous landmark in Germany. Construction for the castle began sometime before 1214. It's been struck by lightning a few times and parts of the castle have been destroyed and rebuilt over the last several hundred years but it's still beautiful. The castle sits on the hillside overlooking the city and the river and it is pretty magnificent. I especially loved all the changing leaves on the trees- along with the brisk weather it really felt like fall in New England. That afternoon we headed to Frankfurt to catch a flight. Our time in Germany was perfect- full of good food, beer, castles, and beautiful scenery.